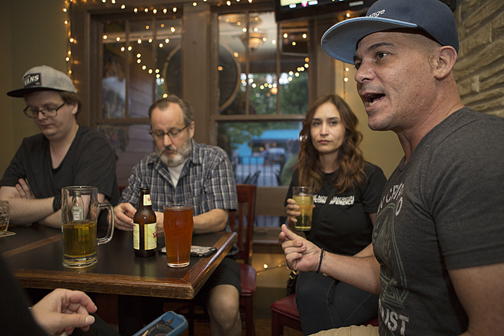 Luis A. del Mazo, Jr., right, shares some thoughts on bitcoins and blockchain during a Bitcoins and Beer meet up group at The Village Pub in East Nashville. A lot of smart money is betting on blockchain – or its broader term, distributed ledger technology – due to its potential impact on the health care, real estate, transportation and logistics, and even music industries. In Nashville, health care giants like HCA, established companies such as Change Healthcare, and start-ups like Hashed Health are investing in new blockchain-based products to improve operational efficiency. Music executives and artists are talking about how to leverage blockchain for digital rights managements and payments. In Memphis, FedEx is piloting blockchain-based solutions to dispute resolutions. In Chattanooga, home to two of the largest truckload carriers in North America and almost 30 freight brokers, a consortium called the Blockchain in Transport Alliance has sprung up to promote the development of blockchain technology applications for the nearly trillion-dollar freight industry, which includes major players such as Bridgestone. “With Nashville being a hub for health care IT and Chattanooga being sort of a logistics hub, there is just tons of room for growth and innovation in those markets,” says T.J. Gentle, a startup veteran and attorney with Miller & Martin’s Chattanooga office. “Block chain technology really started as a grassroots effort from developers who were libertarian-minded and wanted to sort of decentralize transactions from a centralized government or a centralized bank. 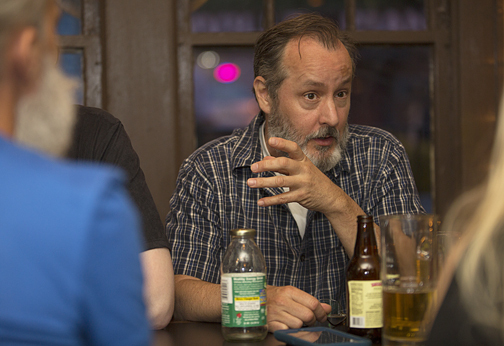 John Davis shares during a Bitcoins and Beer meet up group at The Village Pub in East Nashville. Powell adds even his business, real estate, is abuzz about the possibilities of sharing data securely and simultaneously between the many parties involved in a sale: buyers, sellers, agents, attorneys and banks. “Every time I go to a conference, someone asks about the application of blockchain in real estate,” he says. Last year, blockchain startups attracted over $900 million in traditional venture capital rounds (not counting initial coin offerings), according to Crunchbase. Investment this year may well exceed that. “One technology generation ago, some of the world’s smartest people were spending all their time trying to figure out how to get people to click on an ad,” Gentle says. The term “ledger” refers to the total record of all actions associated with a transaction on a blockchain platform. It is distributed to multiple computers, decentralized, shared and replicated, with access allowed to authorized users. Data is encrypted and is immutable unless changed by an authorized user. Any changes become part of the “ledger” and are updated simultaneously and in real time so that all parties who are verified to access the data can see it at once. Bitcoins and Beer meet up group in East Nashville spend some time together at The Village Pub. By definition, blockchain is decentralized, so no one governing body – whether it be bank, store, or corporation – “owns” data. Because of this, blockchain allows for peer-to-peer transactions, just as Napster allowed people to share digital music files amongst themselves, cutting out the record labels, music stores, artists and others who normally would have gotten paid from the transaction. Essentially, distributed ledger technology returns the internet to the open-source Napster days – before platforms like iTunes, Facebook and Airbnb applied corporate business models on top of such transactions. Blockchain technology also helps solve a critical element that was left open during the early evolution of the internet: that of establishing one’s online identity. In a blockchain environment identities can be established and verified, and “follow” a person through all his or her digital transactions. This can aid and simplify any number of transactions a person participates in through the course of his or her everyday life. For corporate entities, platforms can be built on blockchain networks to simplify and accelerate business transactions. Large corporations are starting to invest heavily in blockchain technology. 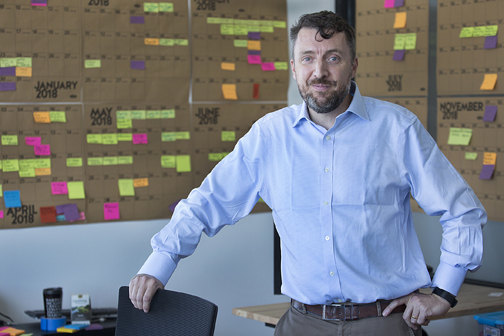 In Nashville, startups like Hashed Health are also generating a lot of buzz. Hashed Health builds blockchain solutions for problems in the health care industry including consumer payments, supply chain management and provider credentialing. Last year, the company secured $2 million in funding from investors including Martin Ventures and formed a relationship with Change Healthcare, which recently launched its own blockchain-based network that can be used by hospitals, physician practices and insurance companies for tracking medical claims and payments. Giles Ward, COO of Hashed Health, a Nashville tech company, that applies blockchain to the healthcare industry. Refreshingly, Hashed Health defies the youth-obsessed stereotype of tech companies: its executives bring many years of experience in health care to the table. Because of this maturity and understanding of a complex system, Hashed Health spends plenty of time saying no to projects. “There are so many places where blockchain makes sense that we don’t have to be a disruptive technology,” notes Giles Ward, chief operating officer. One of those areas is physician credentialing, a necessary but tedious function that is fraught with delays, costs and redundancies. Whenever a physician makes a career move, a new employer must verify credentials like medical school graduation, residency completions, state licensing, biannual recertifications and more. But that process is repeated over and over throughout a physician’s career. To solve it, Hashed Health has built a product called Professional Credentials Exchange (ProCredX). “If I graduate from med school and apply for a license with the state of Tennessee, they check, I think, 18 things. And then I get my license and walk over to HCA to apply for a job and they check those same things,” Ward explains. With ProCredX, once a trusted source performs a verification, it becomes a permanent digital asset and “follows” the person so subsequent employers don’t have to check. “Now, the second and third time that a doctor goes to a new clinic, the employer can just query the system and say, ‘Of the 20 items we need to credential this doctor to practice here, 18 of them have been checked. Three different people have called Vanderbilt, all three of them said yes, he graduated from med school, and the record they’ve created not only says, I’ve checked it and it’s valid, but those three records look the same,’” Ward says. The product utilizes a central feature of blockchain technology: the ability to establish a verifiable digital identity – a sort of “permanent record” that can follow a person and simplify any number of transactions he or she participates in through the course of his or her everyday life. That element was never established by the early architects of the internet and represents a new phase in its evolution. “The first phase we had was the information phase, where people for the first time were able to connect to a network and access information all over the world,” Gentle says. “The next phase was the social phase, where people came online and started interacting with each other. 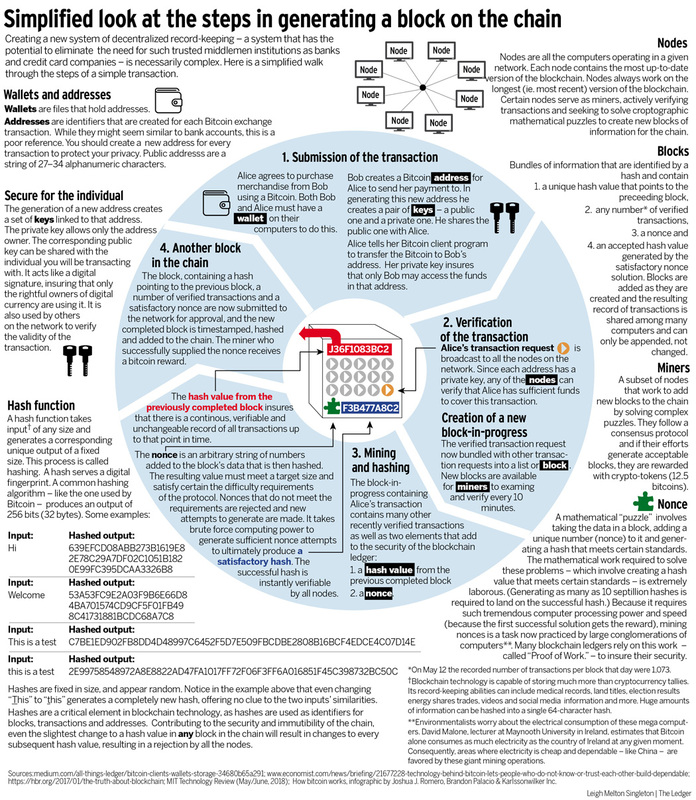 If distributed ledger technology fulfills its promise, consumers may not even notice. They’ll just find everyday transactions getting faster and easier, powered by large corporations like Google, Microsoft, Intel and IBM that are investing heavily in blockchain platforms. “If blockchain is adopted in the right way, people won’t even see the difference,” Gentle points out. Blockchain’s ability to facilitate peer-to-peer transactions will threaten some business models, like banks and credit card companies, who could miss out on their cut if people make direct transactions with merchants. But it also carries increased risk. “Part of the benefit of the bargain when we use these credit card companies and banks, is that they create the security, a way for us to ensure that the transaction is valid,” Gentle acknowledges. 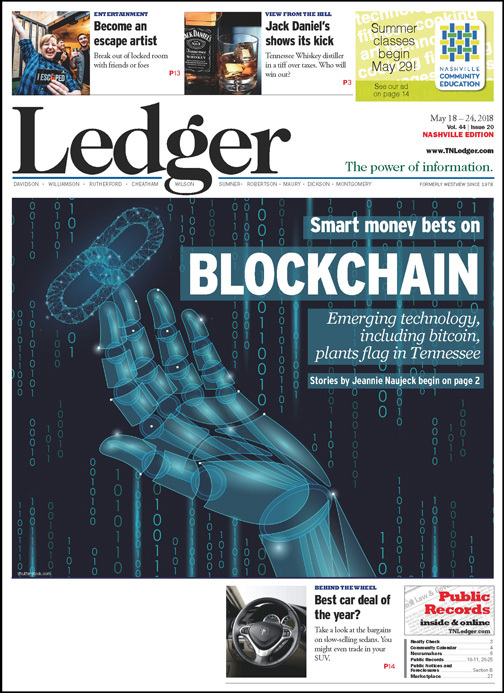 Tennessee’s new law is a moderate but significant step into the potential business applications of distributed ledger technology. It recognizes so-called “smart contracts,” which aren’t contracts in the traditional sense but are an automated series of “if, then” conditions carried out in a blockchain environment. In smart contracts, when the programmed conditions are met, the transaction plays out to an end result, such as the transfer of assets. If one of the conditions is not met, the transaction is automatically locked. It’s a logical next step from digital signatures and digital records and is meant to give people confidence that when they’re transacting and operating under Tennessee law, the terms of their smart contract will be enforced and recognized by the state. Most states have, by now, begun an initiative or passed legislation dealing with some aspect of blockchain technology or cryptocurrencies, according to a survey by The Brookings Institution. Arizona has also passed a law recognizing smart contracts. Colorado is looking into incorporating blockchain solutions into government functions, and West Virginia is testing a blockchain-based platform for mobile voting in upcoming primary elections. Some states have taken a wait-and-see stance as the technology develops and federal regulators assess how to classify and deal with some of its offshoots, most notably cryptocurrencies like bitcoins. Other states have passed laws regulating blockchain-based cryptocurrencies in an effort to stem fraud and abuse from people issuing new digital currencies through initial coin offerings that amount to get-rich-quick schemes. The Securities and Exchange Commission is closely monitoring ICOs to determine whether new digital currencies constitute securities, which would trigger a host of regulatory requirements and costs. Some have taken a more aggressive approach. Hoping to diversify its economy and attract tech companies, Wyoming has positioned itself as the most blockchain and cryptocurrency friendly state in the nation. It has passed laws that exempt cryptocurrency from state money transmitter licensing requirements, and exempt assets held in virtual currencies from property taxes. To encourage companies to issue new cryptocurrencies, the state also exempts so-called “utility tokens,” which operate somewhat like an iTunes gift card in that they give the holder access to a digital asset. If a new cryptocurrency is classified as a utility token rather than a security, it will not trigger securities regulations. And since an increasing number of start-up companies, including some in Nashville, are issuing coins through ICOs to raise capital, any state that deems a new coin issue a utility token instead of a security will be an attractive place to register a business. Competition for the brightest tech minds is especially keen in places like Chattanooga, which has invested heavily in citywide broadband and incentives for entrepreneurs, and Nashville, where much of the venture capital money is pouring into health care technology. “A lot of these companies are truly mobile, especially in the startup stage,” explains Gray Sasser, an attorney with Frost Brown Todd in Nashville who advises companies in the blockchain space. That’s easier now that Nashville is on the radar of young people looking to leave larger cities. 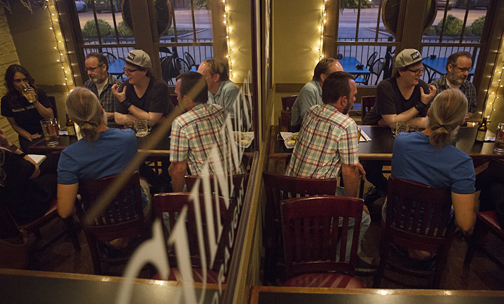 Two years ago, the Nashville Blockchain Meetup group started with half a dozen people. Now it has 900 members, 200 of whom regularly attend the free and open monthly meetings. They include not only members of tech start-ups, but people from more established companies like Vanderbilt, Bridgestone and HCA. “I’m so excited about what this is doing for Nashville, the community it’s building,” says Hashed Health’s Ward, who hosts the Meetup. Ward affirms that Nashville’s ascendance in the national eye is also helping to attract educated workers. In March, Hashed Health developer Deon Summers traveled from Nashville to Washington, D.C., to participate in a blockchain code-a-thon. There he met Zhenting (Zhen) Zhou, a developer from New York City. The two became friends while they built a blockchain-based system that rewards refugee families monetarily for completing tasks around mental health, legal support, education and health care. They won first place (and 1 bitcoin.) Shortly after, Zhou moved to Nashville to work for Hashed Health. “Now we have a brilliant programmer who left New York and came here. He said, ‘I’ve heard Nashville’s cool. I’ll come to Nashville,’” Ward says. But in the end, what creates the conditions for growth and brings the tech sector to Tennessee may be the same business-friendly, low-tax policies that have always attracted more traditional companies. Tennessee’s lack of income tax is an especially strong sell now that people can no longer deduct state income tax, Ward notes. “The way that crypto assets are taxed, these are going to be big dollar decisions,” he adds.